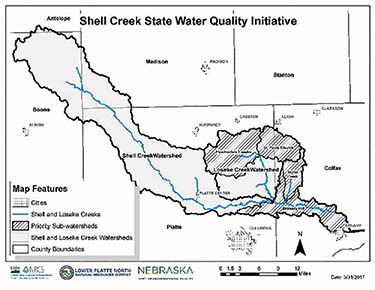 USDA Natural Resources Conservation Service (NRCS) is now accepting applications for the Shell Creek State Water Quality Initiative, according to State Conservationist Craig Derickson. The goal of this initiative is to improve water quality in the Shell Creek Watershed, located in portions of Antelope, Boone, Madison, Platte and Colfax counties. The initiative will provide eligible landowners with financial assistance to install conservation practices like terraces, waterways and sediment control basins, to reduce soil erosion and improve water quality. Landowners have until April 21, 2017, to apply for assistance. Details in the April 5 Albion News and Petersburg Press, print and e-editions.